Both of these teams are coming into this clash on the back of a big win on Tuesday night. This is also a clash between two teams with a 2-1 record, so you should expect both teams to be confident and optimistic for the Thursday night clash. One team has had much less travelling to contend with, which may have an impact on this clash but there will be plenty of expectation from all fans heading to this game. A four-point win in Madrid was a fantastic return for a huge performance from Baskonia. A few people had written off their chances in the Spanish capital but they know that they can take the game to Madrid, and have done so on many occasions. In some ways, raising their spirits and energy levels of the clash against domestic rivals in Europe isn’t the problem for Baskonia, it is ensuring that this fight and desire is still present in other games. This means the game against Olympiacos is a fantastic chance to lay down a marker and show that they are looking to go further in Europe this season. While the Greeks haven’t been at their best in recent times, particularly last season, you are never going to write them off. Olympiacos are one of the teams that keep bouncing back and their strong win over a Milan side that hadn’t tasted defeat in their opening two games was an indicator of their strength and guile. 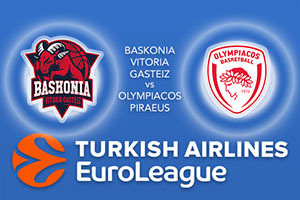 This is a strong and athletic Greek side and they’ll be keen to impose their game on Baskonia on Thursday night. The bookies don’t think that there is too much between these teams but they think the Greeks will just nick the win. Given that Baskonia played in Madrid on Tuesday and are now at home on Thursday, they may just have the edge and this is why you should take Baskonia Vitoria Gasteiz at +2, which you can find at odds of 1.90. Anyone looking for the Over/Under market should look at going OVER 162.0 which is provided at odds of 1.90. Bet Now!